You’ve heard about three dog nights, well this was a five bridge day, and there’s no way i’ll be able to document it all tonight. Actually, it’s becoming clear that i’m gathering so much material that the best approach would be to forget trying to handle this trip with blog entries but rather create a new main menu item titled “Portland’s Bridges“, which i’ve done. Meanwhile a synopsis of yesterday and today’s bridge adventures. Yesterday i rode back and forth over the Hawthorne Bridge in the early afternoon, photographing it, the Tilikum Bridge (which is not yet open but is absolutely beautiful), the Marquam Bridge (a colossal two-deck Interstate bridge that i have no desire to ride over even if there’s a bike lane) and, in the late afternoon, the Ross Island Bridge, about which i wrote yesterday. This morning i rode north on the west bank of the Willamette to the Morrison Bridge, over it and along the east bank to the Burnside Bridge, over it and along the west bank to the Steel Bridge, over it and along the east bank to the Broadway Bridge and over it back to the hotel for a rest. In the afternoon i rode south down to the Sellwood Bridge, across and back, and stopped for an early dinner at the very tasty Thai restaurant named Baan Thai where i also had dinner last night. 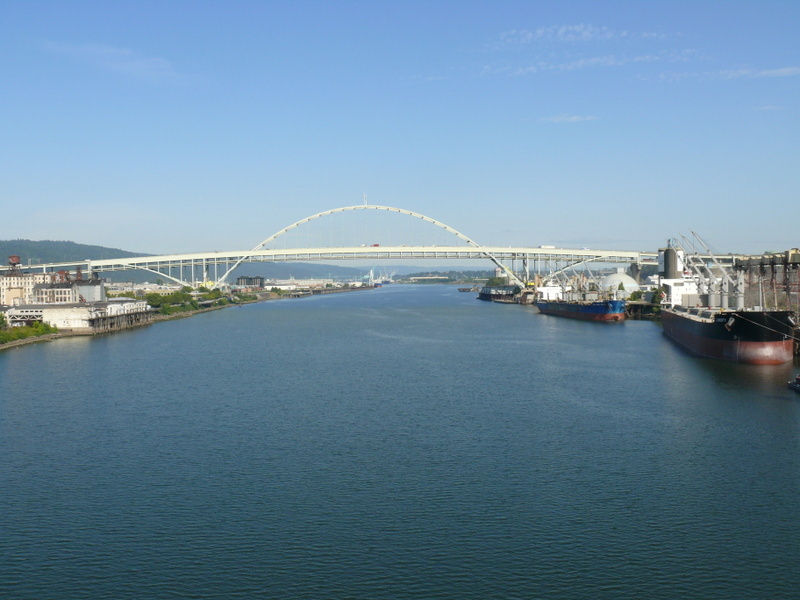 Tomorrow’s my last day in Portland, and i’m planning on throwing the Segway into the Prius and driving up near the Columbia River, where i can then do a Segway trip across the Willamette and back on the St. John’s Bridge, which is so beloved of the locals that four of ’em have recommended it. Then get back to the car and drive around a bit trying to find vantage points from which i might photograph the two Interstate bridges over the Columbia. That’s for the morning. In the afternoon i’ll take the Segway from the hotel and ride down to the Fremont Bridge and hope that there’ll be a two-way bike lane so i can ride up to the crest and turn around and coast back down since i suspect that i won’t be able to get a complete recharge on the battery between morning and afternoon trips. What could go wrong? i ask. Well, other than running out of battery power on the Fremont Bridge and then being so scared to death of heights that i couldn’t just jump off in embarrassment but would have to face Those Questions. Too tired to write more tonight or to add photos of those bridges i Segwayed over this morning, but here’s a pic i took of the Fremont Bridge from atop the Broadway Bridge. OK, and one observation. You can go ten blocks in Portland with a piece of trash in your hand waiting patiently to spot a can in which to deposit it, and yet the streets are spotless. Unlike San Francisco’s, where there’s a trash can at every corner and sometimes in the middle of the block. Look, San Franciscans are famously helpful to tourists, just as the Portlanders have been to me. Hell, the Portlanders may have been even more helpful than San Franciscans. What i refuse to believe is that they’re cleaner. Q.E.D., San Francisco’s abundance of street trash is caused by an excess of trash cans.